As part of the organization’s new Q&A series APSE reached out to writers who covered this year’s Belmont Stakes. The 13 respondents vary in how much they’ve covered horse racing previously, ranging from decades to covering a race for the first time, and encompass reporters who captured the immediacy of the news, those who wrote longer features and columnists. 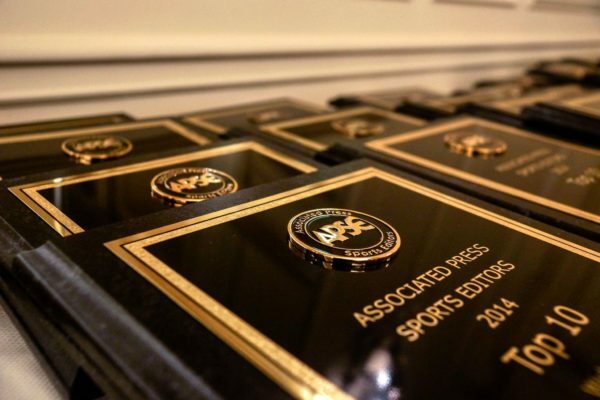 Their work is linked throughout the Q&A for reference and an accompanying Q&A featuring editors whose outlets chronicled the Triple Crown races is also posted. These Q&As provide some great insight from some of the best in our profession and we hope they can be a tool for all in sports journalism, particularly members of APSE. When did you start planning for what you ended up writing from the Belmont Stakes? Tim Layden (Sports Illustrated): In one way, I’ve been planning it for 28 years, which goes back to the first attempted Triple Crown Belmont I covered, for the Albany Times Union in 1987. But more specifically, pretty much everything I did was in the press box that day, informed by all the preparation at past Belmonts. Pat Forde (Yahoo! ): Informally, you’re always planning in your head for how you will write a big event. It’s both a blessing and a curse that I’ve had a lot of practice writing the Belmont with a Triple Crown on the line — there is great familiarity with the overarching themes and key numbers (37 years, 13 horses tried and failed, only 11 have done it), but that also means I’ve written the same column over and over and over. So we really needed a different outcome this year, and got it. But I really didn’t have a formal plan for what I’d say. I had no plan to count American Pharoah’s strides — that just came to me while we were watching the replay waiting for the post-race press conference to start. There has been so much talk about this horse’s amazing stride, so I just started counting. I did it three times to triple-check my math. The only real plan I had was where I’d watch, and that plan was to stick as close to Bob Baffert as possible and try to watch it play out through his eyes. I had been with him both of the first two legs and it worked out pretty well, so I didn’t want to change that formula if possible. As luck would have it, I watched it from just below his box at Belmont — though it was touch and go. Following people around at the Belmont is always tougher than the Derby or Preakness; you need to be pretty ballsy and hope security doesn’t get too twitchy with you. Childs Walker (Baltimore Sun): I started thinking about it pretty much the moment I sent my final edition story on the Preakness. My editor and I discussed general ideas for the stories we wanted to do about two weeks out, and we had a working budget for me and a few other writers about 10 days out from the race. If we’re talking about the game story itself, I probably started thinking seriously about that the day before the race. Melissa Hoppert (New York Times): I’ve been on the Triple Crown trail from the beginning so I had a ton of material. I spent a week with the horse in Louisville, Ky., before he traveled to New York, as well. I actually had too many stories floating around in my head. Jerry Bossert (New York Daily News): I was thinking about it during the week leading up to the race. I knew I was going to mention 37 years for certain. Kevin Armstrong (New York Daily News): My editors alerted me to keep an eye on the horses once American Pharoah claimed the Kentucky Derby, and I did a similar approach last year with California Chrome. Jerry Bossert knows the horses inside and out and Wayne Coffey was writing our column. Christian Red covered Triple Crown races previously, as well, so I needed to carve out an approach that would not overlap with anyone. Chuck Culpepper (Washington Post): I “wrote” two leads in my head (two paragraphs each) — one for an American Pharoah win, one for a non-win — on the Long Island Rail Road on the way to the Floral Park station, repeating and tweaking them in my head on the one-mile walk from that station to the track, on Saturday afternoon about 2, almost five hours before post time. Sally Jenkins (Washington Post): About noon. I marshaled my notes from the draw earlier in the week, and typed up the quotes that had the best chance of being meaningful later. Then I took a walk to the barns with notebook to see what I could see and came back and wrote some paragraphs of scene. Dana O’Neil (ESPN.com): I had a conversation with each of my editors, Rico Longoria and Mary Byrne, a few days before the race. Since we had more than one reporter there, Mary and I set up what my angles would be on Wednesday. I was assigned to write Bob Baffert, both as an immediate reaction win or lose, as well as a write thru. If American Pharoah won, we decided I would write something personal for Sunday and Monday, though we didn’t hammer out entirely what that would look like. Ian O’Connor (ESPN.com): I was out of the country during the week leading into the Belmont, so my actual planning on what I might write started after I arrived at 9 a.m. the day of the event (to beat the ungodly traffic, of course). That gave me nearly 10 hours before post time to do some reporting on site to prepare for whatever went down. Beth Harris (Associated Press): We started planning story coverage a few days after the Preakness ended. The three weeks between that race and the Belmont was a good chunk of time to do interviews and coordinate photos/video/graphics for the stories that we began rolling out the weekend before the Belmont. It helped me a great deal that this year the horse had a California-trainer and jockey since I am based in Los Angeles. I’ve covered Bob Baffert and Victor Espinoza for several years, so that also makes it easier in terms of access and institutional knowledge. How much of what you wrote, both initially and for a final write trough, was prewritten or prepared in advance? How many versions of your story did you send in? Layden (SI): My goal was to write a “magazine” story for SI.com the night of the race, so I wanted it to include all the background reporting that I had done in the weeks leading to the race, at least that which was relatively fresh or exclusive. (This was something I discussed with my editors at SI; when it was decided that I would write for SI.com on the night of the race, it was agreed that I would hold nothing back for the magazine). I only wrote one story. My editor, Mark Beech, filed a space holding piece about 30 minutes after the race. Before the race, I had written about 750 words that I felt would live in the middle of the final piece, and also I had tinkered with a lede, but I wasn’t happy with it and wound up coming up with a new first sentence while I was running around reporting in the aftermath. The final piece was about 2,400 words. So I wrote about 1,650 after the race. Forde (Yahoo! ): I wrote a 520-word news story on American Pharoah Wins and filed it about 3 p.m. so it would be ready to go live the minute the race was over. I just asked my editor, Jay Hart, to plug in a few facts and figures before he published. Then he took that basic framework and reconfigured it for an American Pharoah Loses story, just in case. That alleviated some of the pressure to be super fast with the column. As for the column: I had a byline and a dateline prewritten, and that was it. I didn’t want to box myself in with too much prewriting that might not be applicable in the final analysis. Walker (Baltimore Sun): I sent two versions of the story—a skeleton with two different tops before the race, with room for my editor to fill in a few details once the result was in and then my final version at about 9 p.m. As soon as I got to the track Saturday morning, I started working on the body of the story, much of which I’d thought out the night before. I ended up keeping more of that stuff in the final version than I normally would, because history was such a big part of this particular story, and the backdrop was arguably more important than the race itself. I probably wrote 2/3 of my final story earlier in the day. The deadline work was more about making sure everything flowed and picking the right scenes and quotes to accent what I already had. McNamara (Newsday): Nothing in my main was prewritten. Just started typing a few minutes after the race. For a column about how the race was one, I had a few graphs done before the race but didn’t use them until late in the column. Sent in only one version of each, though I reread each one two or three times before sending them to the desk. Hoppert (NYT): I write the quick web story, which is sent out as a news alert. For all three races I wrote two versions: American Pharoah wins and American Pharoah loses. I’m glad we were finally able to use the winning version for a Triple Crown race. I also contributed to the live blog and wrote a sidebar on a 102-year-old trainer who has been alive for every Crown. That article was posted online Saturday morning and updated after the race. Joe Drape (New York Times): I didn’t write a word until 10 minutes or so after American Pharoah crossed the finish line. There were no pre-planned graphs or template. I knew horse racing before I knew journalism. I grew up going to the track and have owned horses. I’ve written a couple of books about the sport. I also have been a reporter long enough that I know what works for me: I need to see the race, and feel it, and then let it fly. Being on a tight deadline helps with that because you barrel through all your self-censors to get it to the desk. I sent my first take at 8:11 p.m., and wrote through once and it was in at 9:04. Bossert (NYDN): I had a 7 p.m. deadline for my early story so it was basically all prewritten. I wrote it earlier that day and just topped it with the race result. I then got to do a rewrite and did that all from scratch. In, total I sent in two stories on the race in addition to two notebooks. Armstrong (NYDN): I arrived at the track shortly after sunrise on Saturday, visited Barn 1, where American Pharoah was being kept and captured some scene there. No one was there except the horse, the security guard and some stable hands. I walked the grounds, took in the atmosphere and returned to the barn multiple times. I was set with an early image of the horse’s first appearance of the day and wrote the story as a chronological way of capturing the day’s events. Culpepper (WaPo): When the race and the initial comments ended at just after 7, I had 40 minutes to the first deadline (7:45 p.m.), then could write a second version for a deadline at 9:30 p.m. In the first case, I began, as I always do, even if I have only 15 minutes, with a blank screen, nothing written, but much of the outline and many of the words in my head. For the second version, I fixed some sentences, updated some of the quotes and added maybe 100 words. In between, I jotted a handwritten list of things I needed to add for the more-shared and more-circulated second filing, and that list reached six items this time. Jenkins (WaPo): Of a 950 word column, about 450-500 words I wrote were usable after the race. Basically it meant I only had to write a 450-word top, and think of an ending. O’Neil (ESPN.com): On Thursday, I sent Mary 500 words of body, one story file if the horse won and one if the horse lost, that would be for an immediate post within 10 minutes after the race was over. On Saturday, after I went to the backside an hour before the race, I wrote a lede on Baffert and his son, Bode, on my phone, saving a file in my notes app. As soon as the race was ended, I added one more paragraph of his reaction and from the race itself, also on my phone and emailed those immediately to Mary. We were posted within 10 minutes, I think. I then rewrote the entire story – again Baffert-centric – following the press conferences and filed that at 10 p.m. as a write thru. O’Connor (ESPN.com): I didn’t have anything written in advance, and I wrote only one version of my column. That’s the blessing of relatively soft Internet deadlines. I spent a lot of years at newspapers writing running copy on hard deadlines, and then filing one or two cleaned-up or enhanced versions after that. I still have plenty of newspaper ink in my blood, but I don’t miss that part of it for sure. Harris (AP): I prepared in advance different versions of the breaking story depending on if the horse won or lost. I had several hundred words of both versions in the can and available for my editor to go over ahead of time. My main story had six different versions, starting with 200 or so words when the race ended. Although a lot of the pre-written copy was maintained, a significant amount was new with race details and the color and reaction after he won. The first couple versions were written in a straightforward style since our goal is to get the copy out as quickly as possible. Later versions were more feature-oriented. How many of the previous 13 (12 who ran) bids for the Triple Crown did you cover? Layden (SI): 8/7… I did not cover Spectacular Bid (79), Pleasant Colony (81), Silver Charm (97), Real Quiet (98) or Charismatic (99). I covered Alysheba (87) for the Albany Times Union, Sunday Silence (89) for Newsday, and then I took over the horse racing beat from Bill Nack at SI in 2001 and covered the rest. Forde (Yahoo! ): I was 0 for 9. Covered them all from Real Quiet in 1998 through 2014. Walker (Baltimore Sun): I covered California Chrome’s entire bid in 2014 and some of Big Brown’s bid in 2008, though I wasn’t present for his Belmont disappointment. McNamara (Newsday): I covered the 1997, 1998, 1999, 2002, 2003, 2004. 2008, 2012, 2014 and 2015 Triple Crown bids. So that makes 10 for me in the past 19 years. Hoppert (NYT): Three (Big Brown, I’ll Have Another and California Chrome). Drape (NYT): This was either my seventh or eighth time in the box depending on how you count I’ll Have Another. In short, I’ve been waiting for a long time to bang this story out. Bossert (NYDN): I was there for Silver Charm, Real Quiet, Charismatic, War Emblem, Funny Cide, Smarty Jones, Big Brown, I’ll Have Another and California Chrome. Armstrong (NYDN): One. California Chrome in 2014. Culpepper (WaPo): I had been to six: Silver Charm (1997), Real Quiet (1998), Charismatic (1999), Funny Cide (2003), Smarty Jones (2004) and California Chrome (2014). O’Neil (ESPN.com): Much to the chagrin of the veterans in attendance, this was the first Triple Crown race I covered, though I’ve attended the Derby and Belmont as a fan previously. O’Connor (ESPN.com): Four. Funny Cide was my favorite horse story, and the contender I really wanted to see pull it off. I loved the small-town owners from upstate New York in their yellow school bus. The weather that day was dreadful, and it was a shame Funny Cide didn’t get a better track. One of the owners, J.P. Constance, later told me that the Belmont should’ve been postponed for a week and that he should’ve scratched the horse when it wasn’t. Imagine how big a story that would’ve been. Harris (AP): I covered six: California Chrome, I’ll Have Another, Big Brown, Smarty Jones, Funny Cide and War Emblem. Do you cover all three legs of this Triple Crown? How do you think doing so/not doing so impacted your coverage Saturday? Layden (SI): Yes, all three legs. My coverage actually started with a trip to California in mid-April to spend a morning with Baffert, backgrounding his horses (including American Pharoah) and re-establishing our professional relationship. That trip was critical to my coverage, and gave me a huge head start on the story. Forde (Yahoo! ): I did cover all three legs, and wrote extensively on American Pharoah and his people the whole way — starting a week before the Derby. So I knew that subject matter quite well. Also, I have written a ton about Baffert since 1996, plus a fair amount about Victor Espinoza. This was familiar material. Walker (Baltimore Sun): I do. It helped me quite a bit on Saturday because I really knew the stories of the key figures involved—owner, trainer, jockey and horse—and I was able to call on details about them without doing a lot of research that day. I’ve covered the Preakness without covering the other two many times, and there’s no question the story becomes richer if you’re there for the whole thing. I hope that depth of understanding showed up in the coverage, not just Saturday but for the whole week. McNamara (Newsday): Covered all three legs, as I always have. Doing all three provided needed background, access and continuity. Hoppert (NYT): I covered all three, and it certainly helps to have all that material. Plus, like I said, I was able to spend considerable time around the horse before he headed to New York. Like any beat, it helps to know all you can about your subject. Drape (NYT): I do cover all three legs of the Triple Crown, along with the Breeders’ Cup and a slice of Saratoga. I think a Justice Department or NFL writer will tell you the same thing: It’s a lot easier to come up with deadline – or even investigative – stories when you have a deep institutional knowledge, enjoy your beat and continue to want to learn more about it. Bossert (NYDN): I did cover all three races and it helps because I knew the entire story from the beginning. Armstrong (NYDN): I do not, so I knew that my coverage was one crack at potential history. I knew the background for the most part, but focused on not only the day but what it might look like for readers turning back the page to see what American Pharoah’s day was like in years to come. I attended the Kentucky Derby in 2011 when Animal Kingdom won, and loved the thrill that the thundering horses brought to people. I wanted to bring them off the track and see the day as the horse did. Culpepper (WaPo): I covered two: the Derby and the Belmont. As there was only one other Belmont horse from the Preakness besides American Pharoah, this didn’t seem to matter much. In general, the stories start flowing during Derby week, toward their five-week narrative. Jenkins (WaPo): No, I personally didn’t but my colleague Chuck Culpepper did. I think it affected it in the sense that I wasn’t as familiar with the horse’s performances and had less in my notebook to draw from. O’Neil (ESPN.com): I did not. I am a horse racing fan and read avidly about it every year. And thanks to some good friends who are horse racing writers, I learn a lot about it by listening. I also attended this year’s Derby as a fan, so I had some personal knowledge from that experience. I knew enough about the backstory of the horse, the people involved with him, and the Triple Crown drought so in that regard I was ready. The biggest challenge without any actual coverage experience is logistics. Aside from the press conference at the end of the race, it is really on you as a reporter to maneuver yourself where you want to be and need to be to get the scene as it unfolds. Again, I am fortunate to have good friends in this business who have been doing it for years and I quite literally trailed them from the time we left the pressbox to go to the backside at 5:30 until the press conference was over after 8. Without that access, it would be very difficult to adequately tell the scene of the story. O’Connor (ESPN.com): As a general columnist who spends most of his time and energy on football, baseball, basketball, and golf, my horse racing coverage has been limited to a small handful of Triple Crown possibilities at the Belmont. I watch the Kentucky Derby and Preakness on TV, and then I go to the Belmont if my editor assigns it to me. The lack of horse racing experience and insight inspires me to do as much reporting as possible on the grounds before the race begins. I go out to the barn, observe the pre-race rituals, and talk to whatever connections make themselves available. You can usually get some good scene and color out there that you’re not going to get by staying in the press box. I also realize that I’m not really qualified to break down a jockey’s in-race strategy the way, say, a Tim Layden or a Pat Forde can. So I don’t try to. Saturday evening, I made sure I got inside the winners’ circle to write the chaotic scene and to question the ultra-emotional likes of Ahmed Zayat before he climbed up to the stage for the trophy presentation. Bob Baffert’s good friend, Joe Torre, happened to be there, and I was among a small group of reporters that got to him. As a dinner partner of Baffert’s the previous night, and as a four-time champion with the Yankees, Torre was a perfect person to capture the magnitude of this New York, New York moment. Harris (AP): This year, I covered the Derby and Belmont. I have covered every Derby since 2000. Some years I cover the Preakness and others I don’t, depending on the budget. I don’t cover the Belmont unless there’s a Triple Crown on the line because there simply isn’t much interest in the race otherwise. In a year like this one, it would be ideal to be at all three races because at each one you have more chances to develop relationships with the owners, who are often new on the national scene or have returned after not having a recent contender, in addition to the trainers and jockeys. The Triple Crown tends to throw the connections and media together in getting to know each other on the fly. Plus, things can happen with the Derby winner from race to race and being there gives you a leg up on those developments. Horse racing is a unique sport, with a language all its own, and as a writer you can never spend too much time around the people in the sport to learn about everything from strategy to injuries to the politics of the sport. In 2008, Big Brown had a foot issue throughout the three-race series and with an injury like that, it’s important to be around regularly. How do you think American Pharoah will impact your coverage of next year’s Kentucky Derby? Layden (SI): I’ll cover it as always. Probably make an early trip somewhere, and then get to Louisville on Monday of Derby week. As to how it will affect the narrative, I’m thrilled to be set free from the 37-year drought story line. (I also considered walking away from the beat altogether, now that this happened, but I’m leaning against that for the moment). Forde (Yahoo! ): I really don’t know. It’s very hard to think that far ahead now, after being immersed in this story for six weeks. But I’ve covered every Derby since 1988, so I know that the storylines are rarely the same from year to year. I’m sure there will be fresh stuff to write in 2016, but there will be inevitable comparisons to the Latest Greatest. And I’m going to guess up-front that whoever the favorite is will suffer in those comparisons. Walker (Baltimore Sun): That’s a good question, and I don’t entirely know the answer. Preakness will always be a huge story for us in Baltimore, and I imagine as the lead-in, the Kentucky Derby will always have relevance. But debates about the likelihood of a Triple Crown have dominated our coverage of these races for so long, and that pretty well has to change next year. I imagine we’ll do some perspective pieces on Pharoah, looking at how he did or didn’t change the sport. I’m sure we’ll write about the possibility of another cluster of superhorses like we saw in the 1940s or 1970s. But I’m interested to see if his achievement will take some tension out of the series next year. McNamara (Newsday): I don’t think there will be any carryover from this year to the next. There may be more interest with the hope there will be another one, but the next Triple Crown winner won’t have anything close to the impact that Pharoah did. Hoppert (NYT): There will certainly be plenty of stories to tell. And I think the buzz will carry over and make it an even bigger event next year — if that’s even possible. Drape (NYT): Not at all – every year is different and the horses and people lead you to the best stories. Bossert (NYDN): I don’t think much. It will be a new year with new horses. I’m sure there will be mentions of Pharoah. Armstrong (NYDN): The possibility of his next race being contested in Monmouth Park or Saratoga offers us an opportunity to bring local readers inside once again. I love the sport, love covering it. Any opportunity to return to the track is a welcome one. Culpepper (WaPo): I would imagine his Triple Crown will wield a heavy influence on the prospective-story list going in. Two story ideas come to mind straightaway. He won’t take up the whole week leading in, but he could hog a good half of it. It changes the dynamic to which we long had grown accustomed. Jenkins (WaPo): It will make me less certain that the Belmont leg of the Triple Crown is not winnable in the modern era. And more interested in how a horse moves. O’Neil (ESPN.com): I’m an interesting case. I volunteered to be included. I knew we were short handed on people at ESPN.com, using mostly freelancers for horse racing and the editors were willing to allow me to get involved with the coverage. I’ll be curious to see if they handle the Derby differently next year but I do know that when the time comes, I will certainly raise my hand to cover the Derby. O’Connor (ESPN.com): The Derby is one of the few major sporting events I’ve never covered; I’d like to get to one before I’m done. But it’s going to be fascinating to see what impact American Pharoah’s historic victory has on the Belmont the next time a two-leg winner comes through. Yes, a Triple Crown winner after a 37-year wait is a great thing for the sport. But now that the drought is no more, will 90,000 people show up at the Belmont the next time there’s a Triple Crown horse in play? Will the intensity of the media coverage be the same? In some ways, the drought was good for business. That shouldn’t be lost in the conversation. Harris (AP): His achievement will be mentioned in all the stories and next year’s crop of 3-year-old horses will be compared to him quite a bit. Trainer Bob Baffert will get a lot of questions on whether he has another AP in his barn because so much of sports involves comparing athletes and their achievements. Writers rarely can or do take mementos from events, though press passes suffice. Did you purchase a betting ticket on American Pharoah as a historic souvenir? Do you plan on saving your pass in a special way? Layden (SI): I did not purchase a ticket. Never thought about it. Probably should have. I have kept every credential from every event I’ve covered since the Tyson-Spinks fight in 1988 (not sure why I didn’t start earlier), so I will keep this one. And I just asked a friend of mine in the SI Photo Dept to send me a few prints of the cover, which has Pharoah on it, and my byline. I will probably get that framed at some point, but I have a bunch of my SI covers and I’ve been slow to get them framed. I think the cover will be my primary memento. Forde (Yahoo! ): I purchased five $2 win tickets, one for each member of my family. And I did mention to a friend that I’m keeping my credential from this one. It’s easily a top 10 event in my career, probably top five, maybe higher than that. I’d put it up there with the 2013 Iron Bowl, ’92 Duke-Kentucky, Michael Phelps’ 8 golds and any of three different Tiger Woods performances (’00 U.S. Open, ’00 PGA, ’08 U.S. Open). Walker (Baltimore Sun): I did purchase five $2 tickets that I’ll keep as souvenirs for my kids. I also bought a T-shirt for my older son so he could feel like he had an immediate piece of the big event he’d just watched on TV. My press pass just went in the drawer with a bunch of my other credentials from big events—nothing too special. McNamara (Newsday): Did not buy a win ticket for a memento or a collectible. Hoppert (NYT): I did purchase a souvenir ticket, although I forgot to get them at the previous two legs. I keep all my credentials so I can one day show them to my child and say, your mom was there. This one certainly is the most special so far. Drape (NYT): Much to my wife’s chagrin, I save all my passes. I did buy a couple $2 win tickets on American Pharoah for posterity. It’s better than the losers that often follow me home from the track. Bossert (NYDN): I didn’t purchase a ticket but I did save the program from all three races. Armstrong (NYDN): I didn’t place a $2 bet or scoop up dirt from the track. My shoes are still covered with a little dust from Big Sandy as they sit in my closet now, and I don’t plan on throwing the credential away anytime soon. Our poster-style front page — a celebratory shot of horse and jockey taken by Robert Sabo — will wind up on many walls across the city, I would imagine. Culpepper (WaPo): I seldom do these things anymore, and I almost never go to the betting window, but somehow I went home with a $2-to-win American Pharoah ticket in my jacket pocket. Ordinarily I would stand a good chance of losing it, or finding it in the jacket several years from now, but this I shall save safely because, and what a lucky life, it came as a gift from the shining stars who flanked me: Sally Jenkins and Christine Brennan. They paid $1 each. I feel like giving an acceptance speech. Jenkins (WaPo): Yes I bought myself a $2 ticket and one for Chuck Culpepper too. And funny you ask: (Sunday) morning I set the press aside with the ticket and said aloud, I’d like to get a great picture of American Pharoah and frame the works. O’Neil (ESPN.com): I did buy a $2 souvenir bet to keep and purposefully did not use my program, instead saving it neatly in my computer bag. I also intend to keep my pass. I intend – though who knows if I’ll get around to it – to put it all together in some sort of frame to hang in my office. O’Connor (ESPN.com): I wouldn’t ever bet on something I cover, so no kept $2 ticket for me. I will keep my credential and green access bib tucked away somewhere, if only to prove 37 years from now that I was there to watch our last Triple Crown winner. Harris (AP): I purchased a handful of $2 win tickets on AP and I will give some of them to friends who follow racing and couldn’t be there. I’ll save my Belmont program, credential, the official race chart, the post-race transcripts and editions of the New York papers I bought, along with laminating the win ticket, as memories of covering a historic event. What was your lede if American Pharoah didn’t win? Layden (SI): I would have figured that out on the fly. But I would have had to check it against past failures to make sure I wasn’t repeating myself. There are only so many ways to write. Two days before the race, I was 5 grafs into a race advance when I started getting a funny feeling about it. Sure enough, it was almost a dead-on copy of my advance from 2014. So I had to start over and go in another direction. Forde (Yahoo! ): Never wrote one. Glad I didn’t have to. Talk about a story I was sick of writing. ELMONT, N.Y.—The horse inspired a rare kind of belief even shortly after his second birthday. His epic, floating stride captivated some observers. Others responded to a regal nature that seemed to belie his years. He could be one of the best ever they told owner Ahmed Zayat and Hall of Fame trainer Bob Baffert. That faith carried into Saturday’s Belmont Stakes, where many analysts gave American Pharoah the best shot of any horse in years to become the 12th Triple Crown winner and the first since 1978. In the end, however, he could not follow Secretariat, Seattle Slew and Affirmed. He faltered on the same grueling test that had stopped all the other brilliant contenders over the last 37 years. His defeat was the fourth Triple Crown near miss for Baffert and the third for jockey Victor Espinoza, who also rode California Chrome last year. It will add fuel to debates over the fairness of the Triple Crown schedule, given that once again, a better rested contender toppled the would-be king. McNamara (Newsday): The colt born on Feb. 2, 2012, could not end thoroughbred racing’s 37-year Groundhog Day. Hoppert (NYT): For quick web gamer: x won the 147st running of the Belmont Stakes on a sunny but cool Saturday at Belmont Park, upsetting the favorite, the Kentucky Derby and Preakness Stakes winner American Pharoah, and foiling his Triple Crown bid. Poetic, huh? Bossert (NYDN): I’m not sure. I was going to keep it simple with the Drought continues. Armstrong (NYDN): Same as it was with the win. Culpepper (WaPo): They played the tired, old chorus again on Saturday evening at Belmont Park. It seems intent on droning on every so often into perpetuity even if it does date back all the way to the LP days of 1979. It’s the sound of 90,000 voices forging a roar at the top of the stretch of a hopeful Belmont Stakes, then muffling to murmurs as that stretch wreaks another bummer. Jenkins (WaPo): I don’t know. I’d have gone on instinct and immediate perception. Probably something about the heavy sand of the Belmont track and how it seems to slow even an easy-moving horse. O’Neil (ESPN.com): I hadn’t conjured up an actual lede but since I was writing about his trainer, I had sent in a body of a story that talked about his three previous attempts and misses and how, though he is smart enough to know that it is an impossible feat to accomplish, there is still disappointment in being so close to history. O’Connor (ESPN.com): I likely would’ve tried to paint a picture around the losing trudge back to the barn. At some point in that column, I might’ve pointed out that a horse born on Groundhog Day couldn’t prevent another Groundhog Day finish at the Belmont. I’m really glad I didn’t have to write that. Harris (AP): I was going to focus the story on him regardless, with the actual winning horse being secondary in the lede. I had something along the lines of `another Triple try gone awry’ as a breaking lede if he had lost.